Hey folks. Let me start with a question. When you think BBQ meats what is the first thing that comes to mind? I generally think of the same old ribs, pork skewers, chicken for the kiddoes, sausages, burgers and a whole load of fish. Plus, veggie skewers for my veggie friends. Freddy thinks burgers, sausages and every now and then, lamb cutlets. But I don’t think about lamb steaks or the other parts of lamb. I have nooooooo idea why – I should, because I know how versatile lamb is (after all, I use it for anything from curries to roasts). But somehow it never crossed my mind. I have just had some grilled herb pomegranate lamb steaks for the first time ever on my bbq. 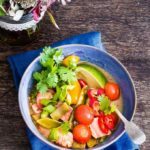 Really delicious, quick and easy and I am certainly a convert. And although here I have cooked them as whole steaks (see the recipe below – and trust me it is a zinger! ), lamb is pretty perfect for almost any style of bbq. 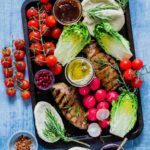 Lamb kebabs anyone (or a lamb shawarma – my favourite); lamb burgers or koftes? Whole butterflied leg of lamb for a crowd or even roast leg on a bbq (it takes on a whole different taste, and although it takes a bit of time, it is seriously worth it). 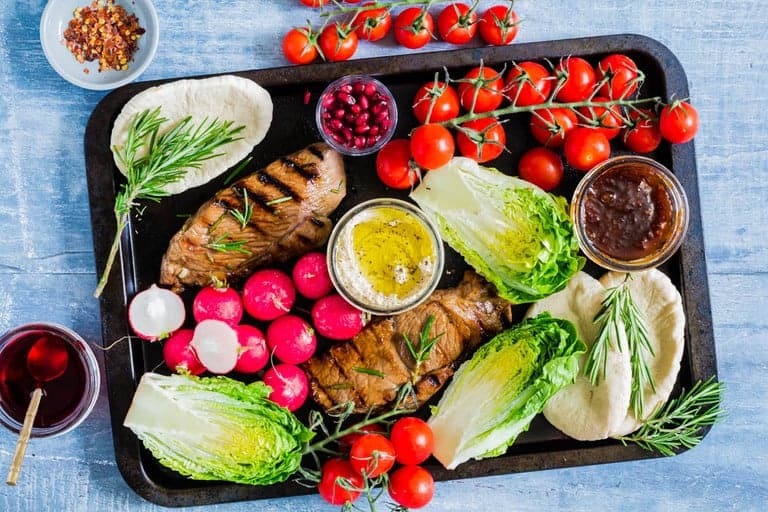 So now let’s talk these grilled herb pomegranate lamb steaks. 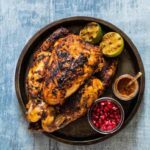 The marinade is so very simple but packs a good zingy punch. The lamb steaks are soaked in a simple marinade of sticky pomegranate molasses, Worchester sauce, olive oil and fresh chopped rosemary. Nothing could be simpler, right? I highly recommend trying it this summer. 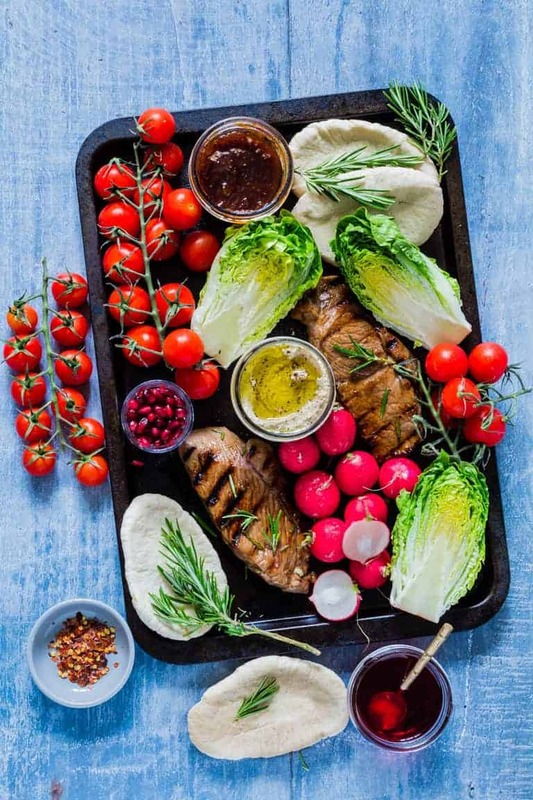 And whilst these grilled herb pomegranate lamb steaks can be served simply with some basic salad – I highly recommend making a little but bigger deal about them. Because they are so, so good. Serve them on a massive platter surrounded with salads, fresh crunchy vegetables, dips like hummus, pomegranates seeds, plenty of tasty tomatoes and warm toasted pitta breads. This way your guests get to try something impressively different, with minimal effort and a whole wow factor. Before I share the recipe with you how about some tips when choosing meat. One thing to look out for when choosing your meat – whether its beef or lamb – is look out for a quality mark like Red Tractor logo. This means the meat is both farm assured and responsibly produced by people dedicated to providing really good food. If you want to know more about beef and lamb including recipe inspiration and information about Red Tractor logo, then please visit www.simplybeefandlamb.co.uk. Or, you could use #RaiseTheSteaks to share your lamb steak barbecue creations on social media. 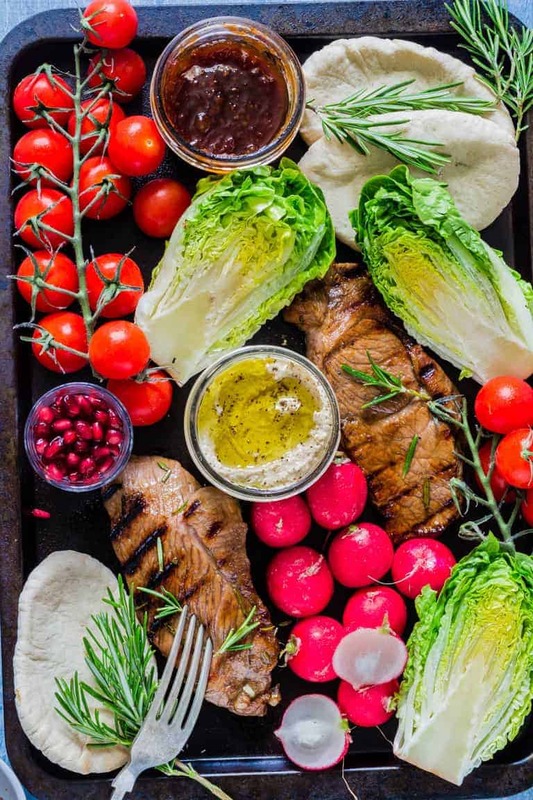 So here is how to make these grilled herb pomegranate lamb steaks. This post is sponsored by some really lovely folk. Thank you for supporting them, as they make it possible for me to continue dreaming up recipes, travel plans and much more for you. Opinions as always, are my own. Don't forget to tag #recipesfromapantry on Instagram or Twitter if you try Grilled Herb Pomegranate Lamb Steaks! It is really, really awesome for me when you make one of my recipes and I'd love to see it. You can also share it on my Facebook page. Please pin this recipe to Pinterest too! Thank you for reading Recipes from a Pantry. Pre-heat the bbq (or grill if using) to medium heat. Put the lamb steaks in a non-metallic dish. Combine all the ingredients for the marinade, pour over the steaks and mix till the steaks are coated. Cover and let marinate in the fridge for 20 mins. meat in particular looks amazing. Loved the tips on selecting meat too. I LOVE lamb meat. This marinade sounds so amazing, especially pomegranate molasses. The whole plate looks just yum! Love the idea of using the pomegranate flavor, yum! Such a pretty spread! I don’t make lamb often but this sounds great. I will have to try it! Great idea, we do actually bbq lamb very ofter…we are in France. I like you marinate but I am not sure where to find pomegranate molasses, but we do have a pomegranate tree. I might try to make a syrup with the fresh fruits. First of all, the photos are gorgeous. I can imagine how good these lamb steaks are! I love these favors! 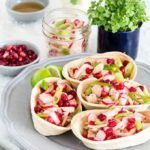 A wonderful way to use pomegranate in a savory summer recipe! The marinade sounds amazing! 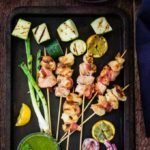 I am doing a grilling series on my blog right now– because it’s the only style of cooking I want to be doing! Definitely on our menu for next week, this looks amazing!